The third album by the English heavy metal band, released on the 21st July 1971 and credited as the foundation of doom, stoner and sludge metal. Certified double platinum after having sold over two million copies. The laminated box sleeve has a top opening and was manufactured and printed by Howards Printers Ltd. These are usually found in poor condition due to the design. This copy has some light laminate lift around the edges and a little to the spine, but has very little wear with a light crease in the laminate at each end & a tiny thumbnail split. This is a very nice VG+ example of the box. The labels are the one-off 'reversed' swirl design with black background & white text, with the small swirl logo & 'VERTIGO' text above the spindle. The labels are clean with no writing & reveal some minor spindle marks to show play. The vinyl has been professionally cleaned on a high end Matrix machine & has come up looking sparkling. Visually, there is some light cosmetic wear to the grooves & some mild paper hairline scuffs which can't be felt & do not affect play. We have play tested both sides of the record & can confirm the sound quality of this first pressing is outstanding. And what a record! Its heaviness has lost NO impact over the years & its influence continues to resonate to this day. On close listen, we detected merely a couple of faint surface clicks at the start of 'Embryo' & very little appearance of surface sounds on any other occasion during playback. There is no distortion [other than the super fierce riffs emanating from Tony Iommi!] & we would grade this example VG+ & must say it's a treat to find & be able to offer. The reversed 'swirl' inner completes the package & is a nice clean example, with just a few tiny thumbnail splits to the edges & no writing. Now we come on to the rarest part of this pressing, the POSTER. This is certainly one of the better examples we have seen, printed on the slightly thicker stock paper and with a matt finish not glossy. There is a small pin hole to each corner but little evidence of the poster ever having been unfolded & actually properly displayed. An Excellent clean example & a must own. This has obviously been kept in a smoke free environment as both the inner and the reverse of the poster are off white. By no means mint, this is a nice VG+ example that comes highly recommended & can rarely be bettered over forty-five years on. 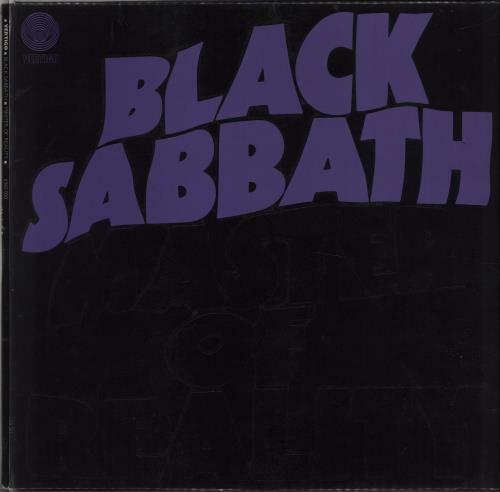 Product Information Black Sabbath Master Of Reality - 1st + Poster - VG UK vinyl LP album (LP record).